Darren Green showed talent for music at an early age when we got our first piano and at age three, barely able to see above the keyboard, he started working out not just simple melodies but quite complex ones. He has played violin, guitar and recorder but his favourite instrument is the piano, on which he writes many of his own compositions. He also composes on an electronic keyboard (solar-powered of course) and an Apple computer. He has studied musical composition at tertiary level and gets something akin to withdrawal symptoms if away from a piano for more than a couple of days. 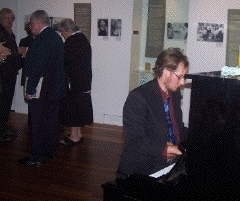 He now performs his own compositions in various public venues. He is available for performances and for consultation on possibilities for composing music for videos (especially nature videos), games and other projects. We have on occasion been asked by developers to 'please don't find anything' on the properties they wish to develop. We ignore these pleas, and do the job we are actually employed to do - to objectively assess the fauna and flora and what impacts any proposed development might have on it. We believe that this also works to the advantage of the developer when we do not find any pressing reasons for halting or modifying the development - by establishing a reputation for honesty in reporting, a 'go-ahead' by us means more than it would from agents who willingly comply with requests to 'go soft' on the developers. To do an adequate job that really means something, we recommend a minimum of two surveys, the first starting six months prior to the time the environmental impact assessment is required. This allows us to look at what animals are present in at least two seasons. All too often the ecologists are called in when only a few weeks are still available, whereas the planning has been in process for months or years, with consultation with engineers and others proceeding well beforehand. A serious assessment of ecological processes and species presence should also begin in the early stages. We have official ethics clearance from Queensland Primary Industries and Fisheries, and abide by all recommendations to ensure that any impacts on the animals we capture or otherwise encounter in our surveys are minimised. We would prefer to forgo an identification than to harm or destroy and animal in an attempt to record it. We are mindful that animals sitting in traps waiting for us to check and release them are necessarily under some stress, and we attempt to minimise this by providing. 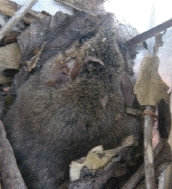 leaf litter and other natural material within the trap, insulating the trap by further leaf litter and bark placed on and around it to shield it from cold at night and sun in the early mornings, and a small food reward beyond that sufficient to initial attraction to make up for the animal being unable to carry out its normal foraging activities through the night. We always check the traps and release animals as soon as possible after dawn. Handling is gentle (with restraint just firm enough to avoid being bitten) and kept to the minimum necessary for identification. fauna survey of Aboriginal-owned property at Mt Barney for Yugambeh Land Enterprises Ltd.
Our prices vary with the job and the client, e.g. 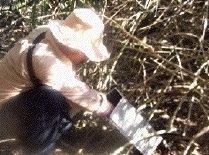 for conservation groups and other non-profit $165.00 per day (other by negotiation, or barter - e.g. assistance with weed removal on our property in return for a fauna survey). 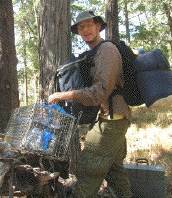 If more than 40km from home or from Brisbane, we may require transport and budget accommodation expenses in addition to the above, but are also willing to camp on or near some properties, with permission of the landowner, to minimize traveling time and cost and to be close enough to check traps as soon as possible after dawn or to quickly remove them if conditions suddenly change (e.g.prediction of flash flooding or bushfire). Darren's musical performance: $330.00 for the evening (negotiable for non-profit groups).